Will Obama Join Lear In the Storm and Rage Against Israeli Insolence? A misreading of the author’s intention in two lines in the fourth stanza of The Star Spangled Banner, provides a clue to the American mindset that supports empire building. Then conquer we must, when our cause, it is just. And this be our motto, “In God is our trust”. Francis Scott Key (at left) included an important caveat in that couplet when he wrote, “when our cause it is just”. He did not write, “for our cause it is just”. Wise leaders know the importance of the “justice” caveat when faced with the temptation to conquer others. 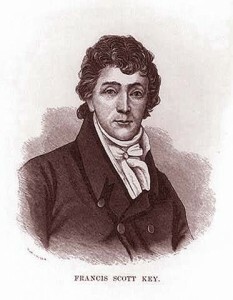 Unwise leaders misread Francis Scott Key. Instead, they create bogus causes to attack others. Three bogus causes that unwise leaders use to justify the urge to “conquer we must” are security of the homeland, fear, and xenophobia. Director-writer M. Night Shyamalan’s 2004 film, The Village, is a seductive cinematic portrayal of how leaders exercise control by creating fear of others. Shyamalan’s narrative is set in an isolated area where the village elders instill fear in the young, warning them of the dangerous creatures that lurk in the surrounding forest. The danger in the forest does not actually exist. But the fear is real. The US-Israel project of conquer and control in the Middle East now beats the war drums against Iran, using the same threat of non-existent nuclear danger that took us into a disastrous war in Iraq. If the international community, led by the United States, hopes to stop Iran’s nuclear program without resorting to military action, it will have to convince Iran that it is prepared to take such action. The leader of a foreign nation speaks on American soil, to an American audience, and instructs the president of the United States to threaten war against Iran. Israel’s open insolence against the U.S. president could not have reached its current stage without the not-so-secret “Fifth Column allies” which Israel has among White House staffers, the Congress, and the media. Like the adult children who turn against King Lear after he relinquishes his crown, Benjamin Netanyahu attacks the US president, the leader of the nation which has given so much of its treasure and its reputation to allow Israel to expand its own branch of the U.S./Israel empire. In Shakespeare’s rendering of the story, King Lear rages at his ungrateful, power-mad adult children (with the exception of one daughter who truly does love him). Lear races out into the storm, accompanied only by his Fool, who mocks him for his weakness. 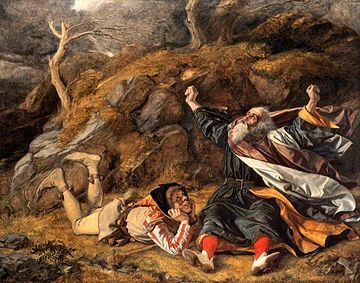 (Artist William Dyce (1806-1864) captures that scene in his painting, King Lear and the Fool in the Storm, shown here). Power has shifted, between the U.S. and Israel, from king to children, from patron to surrogate. Confronted by the insolence of her Israeli Surrogate, U.S. Secretary of State Hillary Clinton sputtered that settlement building is “unhelpful” to the “peace process”. Then the Secretary huddled for seven hours with Netanyahu on Thursday, begging him for a 90 day moratorium extension on settlement construction. In a Friday morning conference call with Jewish community leaders, notes of which were provided to The Cable, the National Security Council’s Dan Shapiro described several of the incentives Clinton offered Netanyahu. They included increased U.S. diplomatic opposition to efforts to delegitimize Israel in international forums; continuing to block efforts to revive the Goldstone Report at the United Nations, promising to block condemnation of Israel at the United Nations for its raid on the Gaza-bound Mavi Marmara, defeating resolutions aimed to expose Israel’s nuclear program at the IAEA, and increasing pressure on Iran and Syria to stop their nuclear and proliferation activities. Do we hear a US government attack on American religious leaders for advocating boycott, divestment and sanctions against Israel? We must assume the Secretary of State knows that to Israel BDS is a major tool in the “demonization” process. Before Secretary Clinton huddled with the prime minister, U.S. Vice-President Joe Biden repeated his intimate “no light between the U.S. and Israel” rhetoric which he used last March when his “no light” mantra was greeted in Jerusalem by an announcement of yet more settlement construction in occupied East Jerusalem. Eight months later, speaking at the opening of the American Jewish Federation, November 7, the Vice President once again assured his listeners that there is “no light between us” . How grateful was Netanyahu to the Vice President for his “no light” assurances? He promptly announced more new Israeli settlements, this time in the West Bank. Prime Minister Benjamin Netanyahu’s trip to the United States this week damaged Israel diplomatically, undermined the country’s relations with the U.S. administration and showed Netanyahu up again as a rejectionist who does nothing but look for excuses and delays to avoid making decisions. When our vice-president is deliberately insulted by the Israeli prime minister, the American government and the American people are also insulted. Also insulted, though they don’t seem to care, are all those American Mainline Christians who insist on promoting interfaith relations rather than demanding that Israel honor the rights of Palestinians. Do Obama, Biden and Clinton really believe that Israel’s conquering of the Palestinian land and its people is a just cause? If they do, exactly what God is it that they trust to tell them that occupation and oppression are acts of justice? During the Christmas season, which begins soon, some of those same “interfaith relations” Christians may travel to Tel Avi and get on an Israeli tourist bus to visit Bethlehem. As they travel, their bus ushered through myriad checkpoints, they will hear from their Israeli guides that the gigantic wall around the city of Bethlehem is solely for Israel’s security. Most of them will believe it. On their way into Bethlehem those tourist Christians should look to the east of Bethlehem and see the foundations being laid for additional apartments, rising as part of the further expansion of the massive Jewish settlement of Har Homa. Har Homa is a new Hebrew name, of course, for the mountain previously called Abu Ghenim (in Arabic, “the father of Ghenim”). The settlement is build on land that once belonged to Palestinian families who lived in the surrounding cities of Beit Sahour and Bethlehem, and the villages of Sur Baher and Um Tuba. Through the windows of their tourist bus this Christmas, Christian visitors headed to Bethlehem will be able to see what all their interfaith promotion has helped produce, Jewish-only apartments built on the Shepherds’ Fields of Beit Sahour, where angels first proclaimed the birth of the Christ child. Will Joe Biden reflect on his “no light between us” promise when he attends a Christmas Eve service? Will Hillary Clinton find her way to a United Methodist Church on that same night and wonder if perhaps she should have used a stronger term than “unhelpful” to describe the further enslavement of the Palestinian population? If they sing, “O Little Town of Bethlehem”, will they think of the shepherds’ field that is no more? Will President Obama pause this Christmas season to recall the U.S. Civil Rights movement that finally broke the segregation control the American white majority held over its African-American population? Perhaps the president will recall the words and music of a song from that 1960s American movement that changed the land the President now governs? The video below uses footage from the current Palestinian resistance. The footage runs under “It Isn’t Nice”, a U.S. Civil Rights song from the 1960s, written by Malvina Reynolds, and sung in the video by Barbara Dane. The lyrics of “It Isn’t Nice”, are below the video. It isn’t nice to block the doorway, It isn’t nice to go to jail, There are nicer ways to do it, But the nice ways always fail. It isn’t nice, it isn’t nice, You told us once, you told us twice, But if that is Freedom’s price, We don’t mind. It isn’t nice to carry banners Or to sit in on the floor, Or to shout our cry of Freedom At the hotel and the store. It isn’t nice, it isn’t nice, You told us once, you told us twice, But if that is Freedom’s price,We don’t mind. We have tried negotiations And the three-man picket line, Mr. Charlie didn’t see us. And he might as well be blind. Now our new ways aren’t nice. When we deal with men of ice, But if that is Freedom’s price, We don’t mind. How about those years of lynchings And the shot in Evers’ back? Did you say it wasn’t proper, Did you stand upon the track?You were quiet just like mice, Now you say we aren’t nice, And if that is Freedom’s price, We don’t mind. It isn’t nice to block the doorway, It isn’t nice to go to jail, There are nicer ways to do it But the nice ways always fail. It isn’t nice, it isn’t nice, But thanks for your advice, Cause if that is Freedom’s price, We don’t mind. 7 Responses to Will Obama Join Lear In the Storm and Rage Against Israeli Insolence? Maybe America fears the truth. Maybe, it’s time to get the truth out so we can have a life. Thanks again, Jim, for your always insightful thoughts. Jim: There appears to be little hope for peace between Israel and Palestine. Why our President is so fearful of Israel is more than I can understand. Mrs. Clinton, and Vice President Biden also seem to bow before Netanyahu. It is a very sad spectcle for America. I believe indeed it is fear. Clinton, Obama, Biden, and most of Congress, and even the media, have fear. And what is that fear? Fear of not getting re-elected. Because to gain political power in the USA, it is presumed to be a “must” to bow before the Israel’s pro-occupation wing. Or else incur its wrath and the dollars and media slander to back its wrath. “Yes we can cut off funding (all or in part) to the State of Israel”. Kudos on a fine article. 1) Congressmen always have their hands out for money. 2) The Israel Lobby spends millions to unseat any incumbent who dares even suggest that the U.S. should re-evaluate its policy toward Israel. 3) We allow candidates to receive out-of-state funding. For example, Barney Frank in the recent election received 52% of his campaign money from out of state. Consider that almost all Jewish money is from our big cities. But with out-of-state funding allowed, the Lobby can control legislators in, say, Idaho, Nebraska, and Montana. In this way, they can control congress. 2) Israel is a rich country; it has a per capita income equal to the U.K. Therefore, it should not receive approximately $7 million a day in foreign assistance. Foreign aid should go to countries below the fiftieth percentile in per capita income (poor countries). The recent “Deficit Commission” recommended that we reduce foreign aid by $1.4 billion. Surely $3 billion of that could be money saved by not funding Israel and its murderous occupation. 3) Money talks. The rich country of Israel should not be receiving $3B annually for doing EXACTLY WHAT WE DON’T WANT IT TO. In other words, the position of our country in regard to Israel/Palestine is a two-state solution, a shared Jerusalem, and a compromise on refugees. The Peace and Security section of the Likud platform rejects catagorically any Palestinian state, declares its border to be the Jordan River, and rejects any division of Jerusalem. In other words, we are paying the rich country of Israel to do exactly what we don’t want it to. 4) Change our 501(c)3 laws to apply only to countries below the fiftieth percentile in per capita income. Israel receives more than $1.5 billion in private tax-deductible donations annually. If people want to give money to rich countries they may, but not for a tax deduction. Thanks for all of this, Jim. Splendid stuff.